After a busy day fighting my way through the supermarket buying my goodies for the evenings cooking adventure (please see post on Roasted pumpkin chicken and spinach risotto) I also managed a stop in at the City to Surf Expo held at the Perth Convention Centre on Saturday. Arriving at the expo I was surprised to see just how small it was. Seemingly set in only one Pavilion there was half of the space dedicated to those collecting their race packs, and the other half to vendors, one of which was Rebel Sport. Rebel sport was selling clothing, shoes, insoles, City to Surf merchandise and also included stalls with Gu Supplements, Garmins, and Skins plus much more. The Garmin stall had an expert on hand who seemed to be constantly repeating himself to the many interested customers asking about the differences between all the Garmin Watches, Heart Rate monitors and GPS units to find out which one would be right for them. They were also offering significant discount on their products promoting the discounts as an expo special. Having a chance to listen in I decided I wanted to try on the Forerunner 610, the latest touchscreen model watch with a heart rate monitor & GPS built in as well as the capacity to monitor pace and distance while running. It looked great in the box, and I’d heard great things about its functionality but once I tried it on I found it was bulky and uncomfortable for my small wrist. 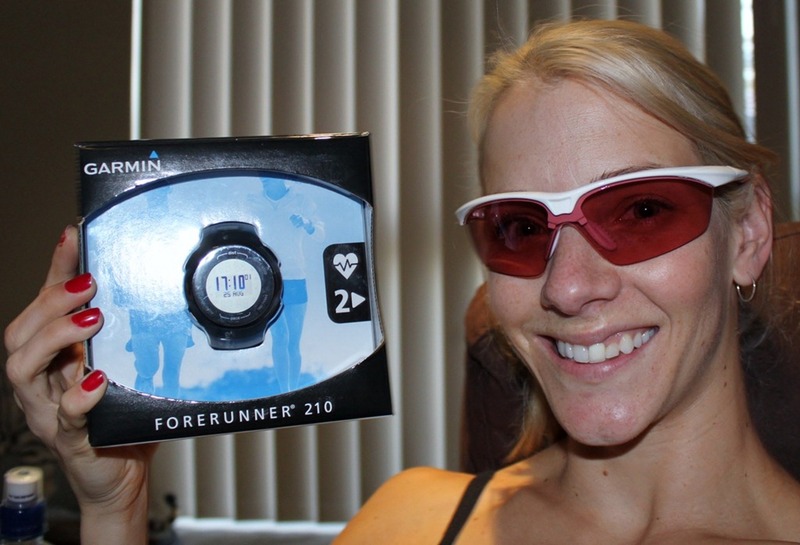 “We hadn’t really considered that” The salesman said as he offered me the Forerunner 210 to try on. It had most of the same features as the 610 but instead operated with buttons instead of a touchscreen. It fit much better and I marvelled at how huge it still looked on my wrist. The strap was slightly thinner though which meant it sat more comfortably against my skin. They were going at a discounted price of $239 so I skipped off happy as larry as I headed to the counter with my new watch. After leaving the checkout, I continued around the corner and spotted a few other vendors selling Altra shoes, injinji socks, running belts, laces etc.. and also a ladies clothing stand something called Skirt Sports if I remember right. Now I’m not sure about you but I was surprised to see there actually was a company dedicated to manufacturing and selling of Running Skirts. I’m certainly no fashionista (which maybe the problem) but I have worn skirts in everyday wear before and I have to say I find them difficult to tolerate. I usually find myself being incredibly self conscious about the length and position of the garment regardless of only choosing skirts with a respectable hemline. So it tends to boggle my mind as to why anyone would actually prefer to wear one of these while working out rather than shorts or leggings. I certainly never believed there was a large enough market for a company to use this as it’s main product and be successful. Lacking in the cracking on the fashion front I maybe but I’m eager to hear other’s opinions if you have tried one or choose to wear one while running. So don’t hesitate to comment if you have an opinion on the subject and feel free to put me in my place as a fashion prude if that’s indeed what I am. 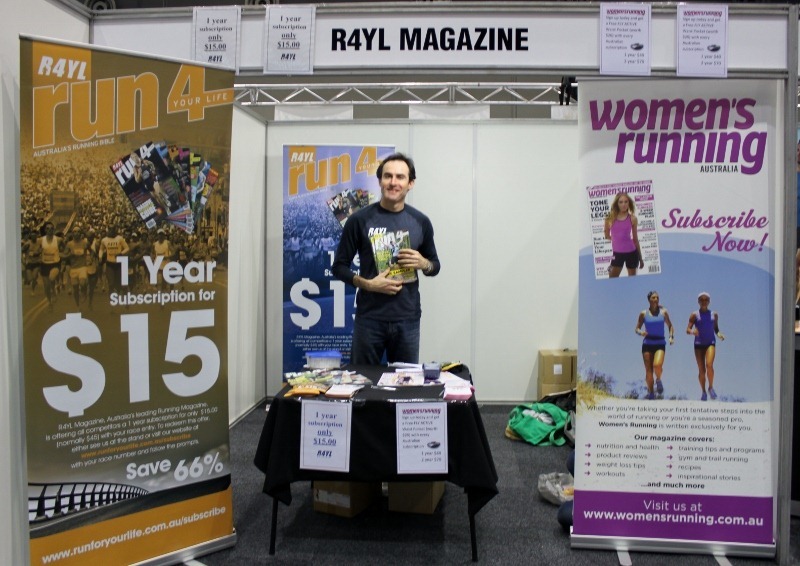 Moving on from the great skirt debate, I then walked through to the next section of stalls and was greeted by a friendly woman and man handing out free sample copies of Women’s Running and R4YL magazine. Great! This excited me as I have always been an avid reader of different fitness mags and these were two of my current favourites so immediately I made a beeline for their stall and signed up for one years worth of each magazine for a low price of $55. While filling out my form I had a quick chit chat with Heath Fitzpatrick (R4YL Business Development Manager) and listened to him explaining the ideas behind the development of each mag to enquiring visitors. For those who aren’t familiar with the mags, R4YL is a publication dedicated to running generally aimed at readers who have a little background knowledge of the sport already. It includes information from the highest qualified running coaches, sport scientists, event developers and top tier competitors and therefore perhaps appeals to those with a more competitive spirit or who are serious about their running. Women’s Running as the name suggests caters more to the female running enthusiast. It covers not only running but also all other factors that go with it specific to us girls. It is easy to read and contains lots of helpful info especially for those just beginning in the sport. After handing in my subscription forms Heath handed me a complimentary issue of Women’s Running and even took time to pose for a photo for me. Thanks Heath for your time, and it was great to see both Magazines represented at the Expo. I look forward to lots of reading! Next I was over to a Rocket Science Sports and XO stall. They stocked a range of triathlon tanks and suits as well as compression garments, gels, electrolytes, socks and much more. Their stall allowed me to get my hands on some much needed compression socks great for keeping the lactic acid monsters out of my calves for my upcoming ‘Trailathlon Event’ in October. Last but not least my stall of choice to visit was the Ryders Eyewear stand where I met a lovely man named Neville Mason. Neville was super helpful in recommending a lightweight frame pair of glasses suitable and popular for running in all conditions. He demonstrated how the lens was interchangeable and how the nose piece and arms bent to provide an ideal fit even for my skinny midget head. That’s it, I was sold! No longer would I have to struggle with my current stiffed framed safety sunnies (yes freebies from my work on the mines) bobbing up and down on my nose, creating an annoying flashing strip of sun across my eyes blinding me midstride as I ran. Neville also offered me some advice about ensuring the glasses always fit slightly away from the face to allow for airflow to prevent them fogging up. I imagined this would be particularly useful while wearing a hat in the heat, since this is when my ol safety sunnies usually give me the most grief. There were a few other stalls with foods and supplements as well as a stand by the Running Centre. Although the Running Centre were stocking mainly undergarments and a small selection of clothing I suspect the giants Rebel Sport may have beat them to it in this regard. I had heard whispers that the smaller vendors had been unable to present stock if it coincided with what was being offered amongst the Rebel Sport products, although this was never officially confirmed it certainly could be easy to believe. 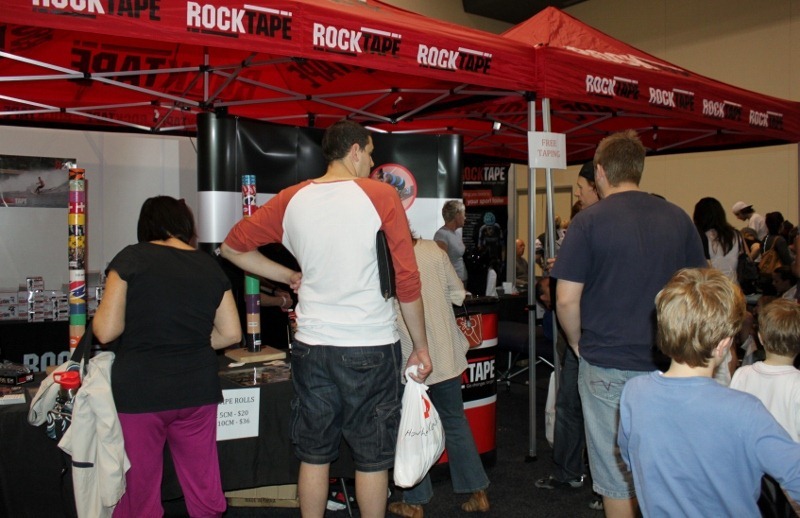 The other most popular and last stall in the line was Rock Tape who were constantly busy with people taking advantage of their free strapping service in preparation for the run. I even spotted one lady with strapping all up and down both legs front and back with what seemed like little bare skin left. I secretly hoped she wasn’t doing the marathon distance! 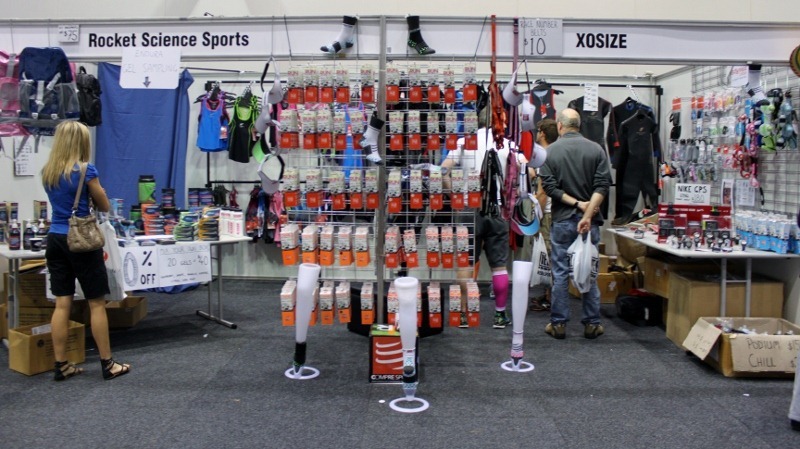 Even though the expo was small, the range of stalls and products on offer covered anything and everything a city to surf participant would need or want plus more. The friendliness of the vendors also lent a comfort and professionalism that made you feel confident you were getting the best advice possible. They say that you should always reward yourself with non-food related items for achieving your fitness goals. And knowing that little to nothing would stop me from running the City To Surf, lets just say I purchased my rewards in advance! Fingers crossed they make me run faster! Sure did! Even though I thought I was struggling I managed to still run a PB yesterday. I was really impressed with the Ryders Insight sunnies, the fit is perfect and even though I thought I would still be squinting heaps with such bright lenses, I actually found they are pretty good in the sun and they ever cut out a fair amount of glare. No fogging or epileptic flashes either… Winner winner chicken dinner! BTW Have you ever worn one a running skirt? Ps: The glasses come 3 lenses. A black/grey set of lenses, a clear smoke colour, as well as the pink ones that are in the photo.